After the 1919 – 1920 season, the NHL took back the Quebec franchise and sold the team to the Abso Pure Ice Company of Hamilton, Ontario. 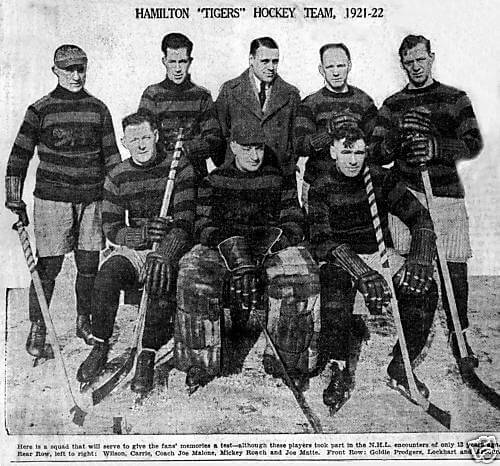 The club was moved to Hamilton for the 1920 – 1921 season and renamed the Hamilton Tigers. This was done to prevent the startup of a rival league, which was trying to land a club in Hamilton. (see Eddie Livingstone) At the time, the NHL had no teams in the United States and no teams in Western Canada. Hamilton was the fifth-largest city in the country and third-largest in Central Canada (pop. 114,200) and therefore was considered a vital market. Percy Thompson, a part-owner and manager of the Barton Street Arena, would be the manager of the team.